Within the next ten years, the number of people and families with elderly relatives to care for is likely to exponentially increase, with the old in some Western populations actually likely to outnumber the young by the early 2020s. This means that more and more families will have to make long-term plans to care for a relative into old age. The added pressure of a rising elderly population will manifest itself in more money needed for public and social care provision. In order to both save money and (more importantly) provide a more comfortable and enjoyable experience for our elderly loved ones who are in need of social care, it’s going to be necessary to make more provisions for our older friends and relatives to be cared for in their home. • Help accessing a home (e.g. ramps or hand rails when approaching the front door). • Help with mobility in the kitchen and bathroom. • Alarm/warning systems in the event of an accident or fall. These are the main types of obstacles which an elderly relative may face as they deal with the difficult challenges and lifestyle alterations caused by decreased mobility in old age. 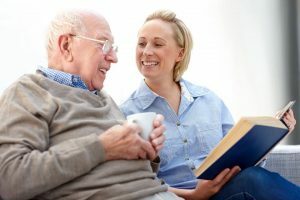 Below are 5 of the most useful tips which could make all the difference, and hopefully ensure that your elderly friend or family member lives a much happier and fulfilled life. Moving all the essential facilities in your house to the ground floor can be the simplest way to improve overall access and ease any potential mobility issues which an elderly loved one may face. If there’s a way of suitably renovating the house so that there’s access to a bedroom, dining area and living quarters on the ground floor, then this will minimize the risk of any trips, falls, emergencies or accidents. The decision to move all the major facilities/core rooms in a home to one floor may form part of a wider conversation about whether an elderly relative may wish to downsize to a bungalow, or a house with easier accessibility built in to the design. Bathing and washing are the most private and essential of daily rituals, and a person’s ability to bathe and wash safely and easily is arguably central to their sense of dignity and self-esteem. This means that accessibility improvements to a bathroom are arguably some of the most urgent alterations you can/should be making to a home. • Level access/walk in showers, ensuring that an elderly person doesn’t have any immediate trip hazards, and minimising the risk of falls as they get in or out of the bath/shower. • Handrails mounted to the walls, should an elderly relative require help getting up off the toilet. • Removing any other extraneous trip hazards, such as bath mats or even ripping up tiled surfaces which may inadvertently mean a person could slip or trip when the surface becomes wet. These can be an essential addition to any household and are once again an invaluable tool for minimising trips and falls. If your elderly friend or loved one is adamant that they don’t want to make too many major changes to their day-to-day lifestyle and want to keep their room layout broadly the same, then a chair lift can be a great way to maintain both continuity and guarantee safety. Installation and maintenance are increasingly simple. By this, we mean replace everyday household accessories which control the day-to-day operation of the house. These include light switches and door handles. Switching your existing light switches to touch lights or dimmer switches can give an elderly relative an opportunity to take advantage of more subtle lighting states, which is especially useful if they are partially sighted/having difficulty seeing in darker rooms. Likewise, replacing any door knobs with lever handles is an easy way to ensure that your elderly relative can enjoy easier mobility when moving between rooms. Likewise, re-arranging kitchen drawers and storage to make it more easily accessible is another straightforward way of improving accessibility and minimizing risk. This may be a source of understandable reluctance for someone who may be having to confront problems with mobility. After all, conceding that you need some of kind of emergency back-up system can, in turn, feel like an admission of vulnerability, and preparing for a worst-case scenario that none of us want to think about as we get older. Nevertheless, installing a personal alarm system in the event of any serious accident or fall is a vital last line of defense in ensuring that your elderly relative or loved one is safe and secure in their own home. A number of telecare systems allow a homeowner to alert a carer or member of the emergency services should they find themselves falling victim to a trip, fall or major accident. Encore Care Homes offer care homes across the south of England. Their private homes offer palliative care, short-term respite care, long-term residential, and nursing care.